Hand-Painted Letters by Forrest Wozniak! I've always been fascinated with sign painting. This trade is not all that different from letterpress – in an age of digital/vinyl printing, skilled craftspeople are making high-quality, hand-painted signs that stand out from the crowd. Sign painters pay the same amount of attention as letterpress printers do to letter style, spacing, color, etc – they just do it with a brush. The Twin Cities has a great, vibrant community of sign painters, and it's always been my dream to have my shop name painted on my studio door. Last November, I was so excited to partner with Forrest Wozniak to make this happen! From the beginning, I knew that I didn't just want my logo painted on the door. My logo is based on digital type (something I hope to get around to changing sooner or later), not hand-drafted letters – and it seemed wrong to hire a sign painter to just approximate a digital type design. So, I asked Forrest to meet me in the studio, and draft a design that matched the spirit and ethos of the shop. I pretty much loved what he came up with. In particular, I'm a fan of the diagonal stress on those e's. The only edit I had was to make the a in "and" lowercase. We decided on classic gold and black for the paint color, and on a chilly day in November, Forrest gave my shop its sign! 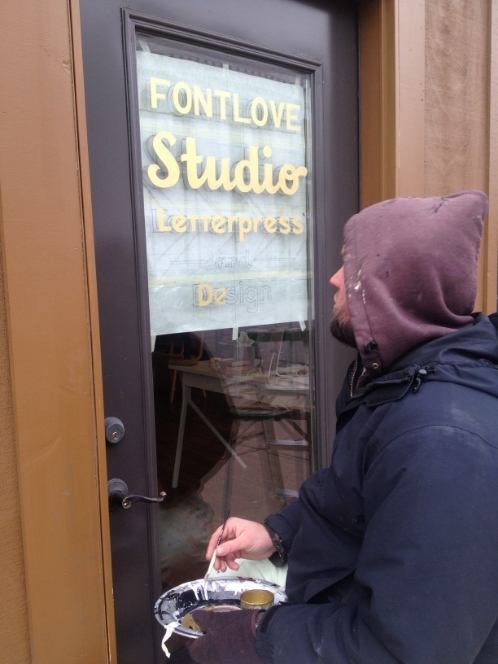 I love that when I look at my sign from inside the studio, it's wrong-reading – like letterpress! Forrest was awesome to work with, and extremely knowledgeable about typography and lettering. Next time you're in the area, stop by and take a gander at his work.